It is time for the government to take critical action and upgrade our military defense. Bre radiated grace. In an industry where egos reign, she knew everyone's name, and at every opportunity, she showed them the love of Christ. Partnering with Saudi Arabia is about doing the most good, and the unjust killing of a Saudi national does not change that. In the middle of all the scandals and squabbling in Washington, the Trump administration deserves credit for keeping the pressure on al-Qaeda. He rejects the postwar order on the ground that it puts the U.S. at a disadvantage. 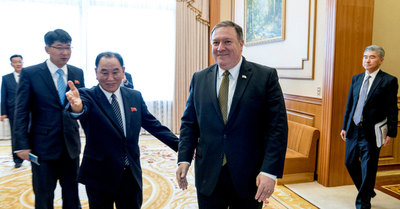 In Pyongyang, Secretary of State Mike Pompeo was “very firm” in insisting on the North’s complete denuclearization, his spokeswoman said Saturday. Hugh Hewitt joins Secretary of State Mike Pompeo, to discuss the historic North Korea Summit, the Immigration Policy at the border, and so much more, tune in to find out what they talked about, exclusively on Hugh Hewitt’s show. Pyongyang's propaganda changes from blasting the US as enemy to a much more conciliatory note.